June 29 – July 5 – Craig and L'Or L.
June 29-July 5: What a wonderful week! 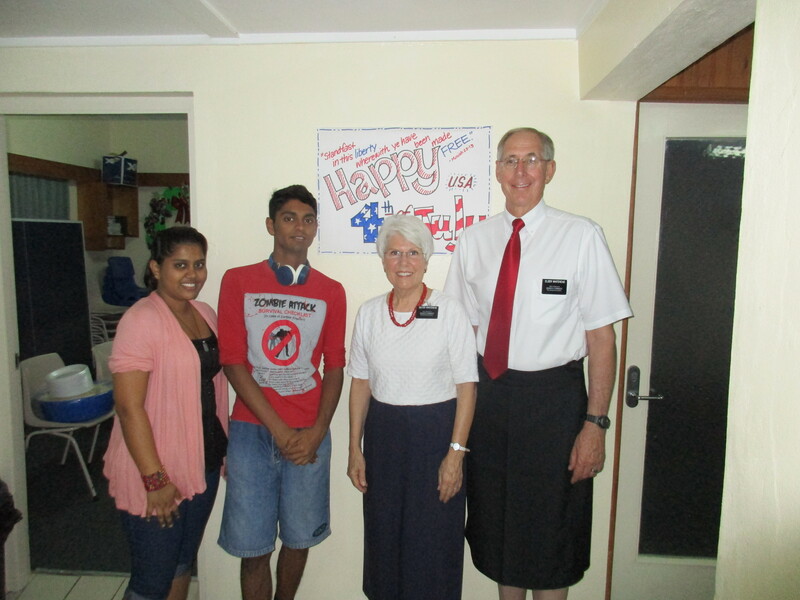 We started the week visiting with our landlords Avinesh and his wife Shammi, who live in the home next door. Later, when we met Avinesh’s father at the sporting goods store the family owns, he told us that five generations of their family have lived in that home, and four of them live there together now! 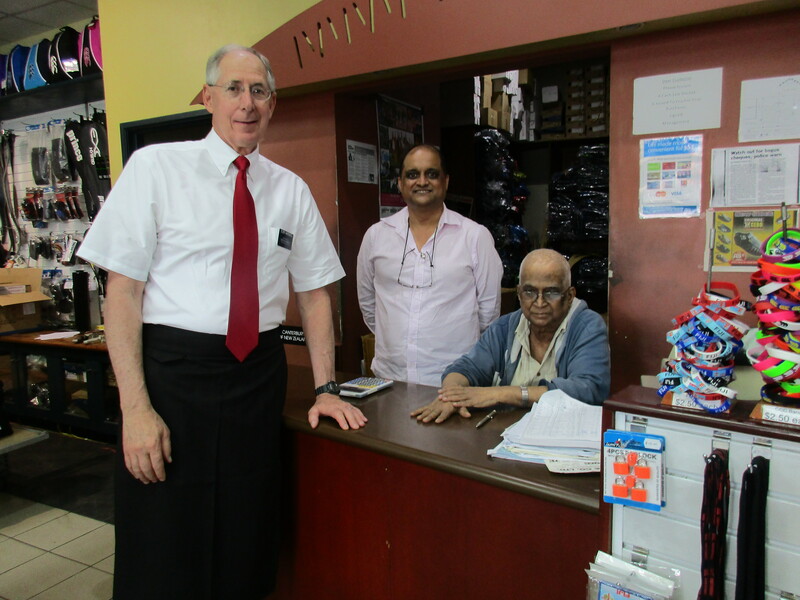 They are Christians from India, and we look forward to getting to know them better. The YSAs who attend the classes we teach are very respectful, willing to participate, and we’ve really had fun playing games with them. Elder Whitehead challenged Manny, Jeanette, and Lini (as well as everyone else at the Institute) to see who could get a top to spin for the longest amount of time. The competition was pretty serious, but so far “Elder White-socks” is the champ. Vinaka vaka levu to Joeli for spending his free afternoon teaching us some Fijian phrases. It really is a beautiful language! We’re getting used to driving on the left, and had fun shopping in downtown Suva on preparation day. 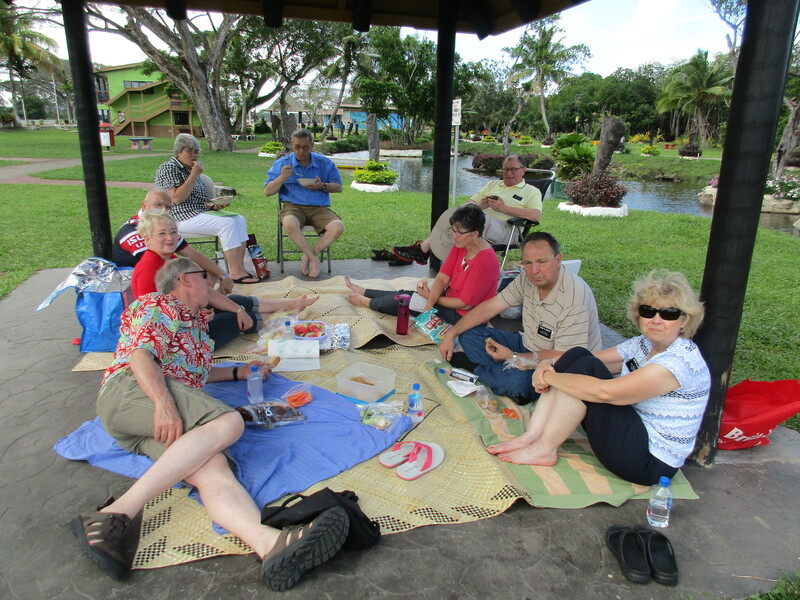 Saturday the senior missionaries got together for a 4th of July picnic at the beach, and then we had our movie night and played games at the Institute with 34 wonderful YSAs. We showed a western movie, “Love Comes Softly,” popped popcorn, served an apple pie dessert, and sang America the Beautiful. October 10 we’ll celebrate Fiji’s independence day – can’t wait to see how that celebration goes! 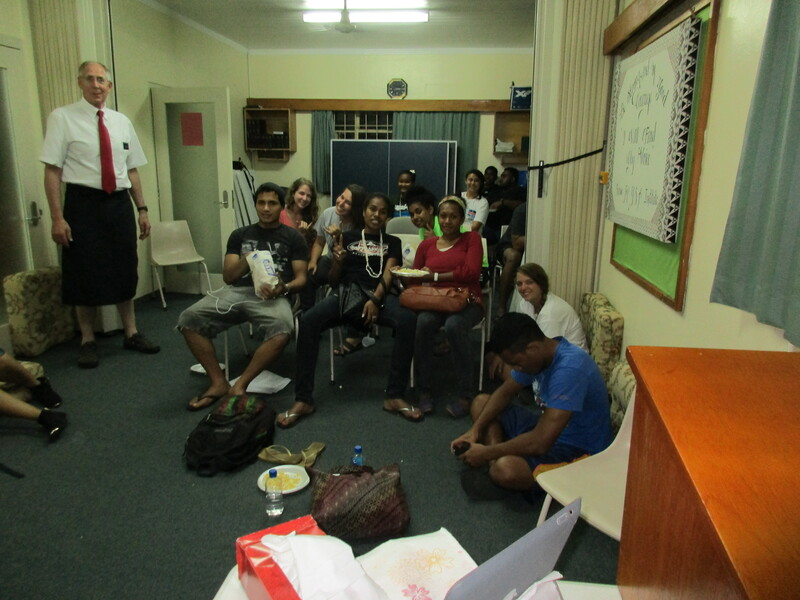 We are assigned to attend the Tamavua 2 ward, but visit other wards so we can invite the YSAs to Institute. Yesterday we walked into a chapel eleven minutes before a sacrament meeting was to begin, and were surprised to see more than half the chapel already full, and everyone on the stand — including those who were going to administer the sacrament — all sitting reverently. The rest of the pews filled in quietly, and at five minutes to the hour someone played some soft prelude music, followed by a wonderful testimony meeting. That was impressive! We were so grateful to be a part of such a reverent worship service. A highlight of the week was a Family Home Evening Sunday night in the Samabula chapel with 79 YSAs. Most walked there in spite of the rain, some came in taxies. Some were still fasting because they had been in meetings all day and hadn’t been home – and yet they still came. Craig and I both spoke about the blessings of the temple. We have so much to learn from these great young people. And can they ever sing! With the great acoustics of a chapel with a tile floor, we could have listened to their a cappella harmonizing all night long! I felt badly that I only brought 72 cupcakes, thinking about 40 or so would attend like our movie night, so I’ll have to do a better job of refreshments next time. Once again, we feel more blessed than we deserve – it truly has been a wonderful, awe- inspiring week!